Master Hand being used on Temple. The Name Entry glitch is a glitch in Super Smash Bros. Melee. The glitch allows a match to start under conditions that would normally not be allowed, enabling a number of unusual effects, most notably allowing a player to play as Master Hand. The Name Entry glitch is unusual for the amount of time it took to be discovered; it was discovered in 2008 on a German gaming website by Smashboards' Exchord92 and was posted to Smashboards in June 2009, a year after the release of Brawl and almost eight years after the release of Melee in 2001. This method requires more precise timing, but is the only way to perform the glitch outside of Versus Mode. On the character select screen, the player must place the cursor over the name field of their character, and then press A and B simultaneously. Release A, but hold onto B. Because A has been pressed on the name field, the list of names scrolldown will appear. At the same time, because B is being held down, the game will go back to the menu in a few seconds. Within these few seconds, the player must scroll down to the "Name Entry" button and press A again. The timing of the second A press (to go to the Name Entry screen) and the effect of the held B button (to go back to the menu) must occur at the same time; if done correctly, the game will go to neither location but rather skip ahead (to the Stage Selection screen, if in Versus Mode). At this point, if the player can select a stage and have it load properly without the game freezing, they have successfully performed the Name Entry glitch. To make this method easier, it is recommended to have only exactly one name present in the name dropdown. When this is the case, the cursor will automatically be on the "Name Entry" button upon pressing A for the first time in the name field box, so the player will not have to worry about quickly scrolling to the button and can focus solely on timing the second A press. If the second A press is performed too early, the game will go to the Name Entry screen before the held B button has the chance to take them back to the menu. If the second A press is performed too late, the B button will send the player back to the menu before the A press has the chance to send them to the Name Entry screen. These facts can be used to help narrow down the timing of the second A press. This method requires less precise timing, using a second controller to manually go back rather than relying on the timing window of the held B button. As a result, it can only be performed in Versus Mode. The Master Hand glitch is the most popular of the four scenarios. To perform this subglitch, perform the Name Entry glitch while one or more characters in the match are human (HMN) players that do not have any character selected. These players will become Master Hand once the match starts. While up to four Master Hands can be in the match, due to the way the game is programmed, only controller port 3 can actually control Master Hand. To minimize chances of the game freezing, use controller port 3 to select the stage on the Stage Selection screen. Once the match starts, the announcer will shout "Ready... Go!" as in a standard match, but the camera will pan over while Master Hand flies in laughing maniacally. If controller port 3 is able to control Master Hand, the player has successfully performed the Master Hand glitch. This subglitch can be used to play as an all black character, similar to Dark Link in Event 18: Link's Adventure. Note that because all players in the match are on the same team and have no opponents, any CPU characters won't attack or move at all, except to recover or use items that they are attracted to (such as Poké Balls). If Friendly Fire is not turned on, no characters will be able to fight, unless bombs can be used. If the mode is set to Stock rather than Time, the match will end immediately (making it a case of the 0-Second Melee glitch below). This subglitch can be used to play a melee that lasts 0 seconds. To perform, set the match mode to Stock with any number of stocks. Next, choose any character(s), but choose no opponent(s) (so if there are multiple characters, they must all be on the same team). Perform the Name Entry glitch to start the match. The match will end instantly once it starts, with the announcer shouting "Go!" and "Game!" at the same time. This also occurs in Stamina Melee. Selecting PokeFloats in v1.00 will trigger the All-floats glitch. This subglitch allows the player to play on the stage alone, with no opponents or other players. To perform, set the match mode to Time, Coin, or Bonus, then choose a single character and no opponents or other players. Perform the Name Entry glitch to start the match. When performed correctly, the player will be fighting on the stage alone, with the camera somewhat zoomed in on them as normal. Note that this subglitch and the Master Hand glitch can be done at the same time, by not choosing a character. 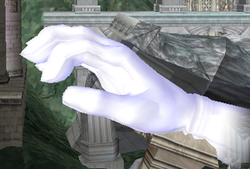 However, the game will freeze if Master Hand uses the finger walk attack ( + ), as he will have no opponent to target. It is unknown why Master Hand's other attacks do not similarly crash. As mentioned above, the Name Entry glitch works by forcing the game to attempt to go to two different menus at once, causing it to end up going to neither but rather skipping ahead to the Stage Selection screen (or the equivalent screen after the character selection screen, outside of Versus Mode). The effect of this is to allow the player to force a match to start, even under conditions that the game would not allow (namely, having human players who haven't selected a character yet, or having no opponents selected in the match). The Master Hand glitch works because all characters in the game have an ID number (for example, Mario has an ID of 1), and Master Hand has the default ID number of zero. However, zero is also used as a placeholder on the character select screen for human players who have not picked a character yet, and the game is programmed to reject this ID number and not allow the match to start if any players have invalid character IDs. The Name Entry glitch effectively forces the match to start regardless, thus causing any unselected players to have Master Hand (character ID zero) loaded as their character. This video shows all four outcomes of the Name Entry glitch. This page was last edited on January 22, 2019, at 06:11.